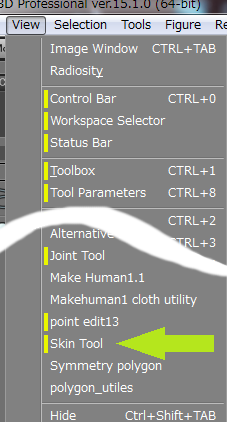 - Add Multi toggle button for single edit weight at Multiple vertices selected. - Problem solved in new Lock function. 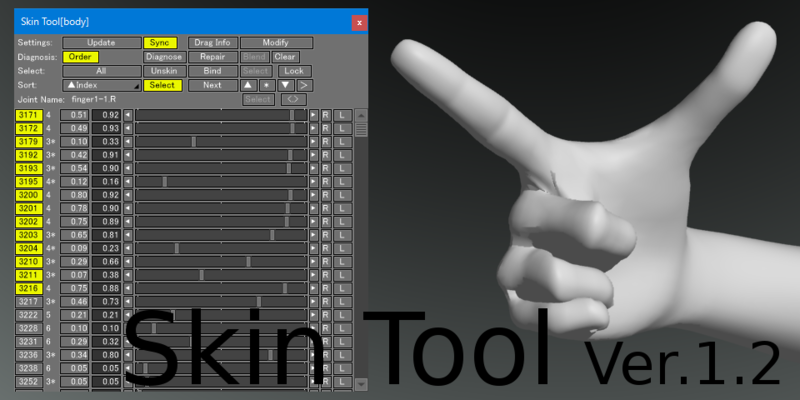 Skin Tool is a useful tool to fine-tune the skin of shapes. And then, it also have diagnostic and repair functions of the skin. when Vertex Blending, it edit the Weight values by the actual degree of deformation(called Actual Degree), insted of the real Weight. And, it change does not change the Actual Degree of the other joints. It can display the table sorted by location of the vertecis. So you can edit while compared with nearby vertecis. It can also place selected vertices before. It has diagnosis and repair features, and also has covertion feature from the Classic skin Type to Vertex Blending. When Windows environment you launch the Shade 3D, after copying the skin_tool.dll(skin_tool64.dll for 64bit version) to My Documents\Shade name\pluings folder. If the Mac environment, you launch the Shade 3D, after coping the skin_tool.shdplugin to Documents/Shade name/pluings folder. Shade name: a folder name, including up to Shade of the version, it will be created automatically at start up of Shade. 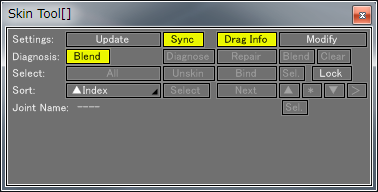 If you find a menu of Skin Tool in the View menu, the installation is successful. When you click this Skin Tool, following compact window and then Shade's Skin Window will appear. Actual Degree at the joint moved are sum of the joint of his own Weight and all of Weights of their children. By in such representation, beginning from the Actual Degree of the most parent of joint is 1, it went decreased Actual Degree for each of its children, only the Weight of the last joint is same as the Actual Degree. This specification is smart for skin definition, but it is no easy to get the Acual Degree. So I designed a tool that edit Weight By the Acutual Degree. ※ Can not use in Shade 3D Basic version. Go to "plugins/win" directory and select "wskin_tool.dll" if you want to use 32-bit version of plugin, or "wear_skin64.dll" if you want to use 64-bit version. Then drag and drop the selected file to your local document directory where you will find "Shade 3D ver.15/plugins" directory. Simply drop the .dll file there. Go to "plugins/mac" folder and select "wskin_tool.shdplugin" file. Then drag and drop the selected file to your local "Documents" folder where you will find "Shade 3D ver.15/plugins" folder. Simply drop the file there.